Claims Q&A: Hyaluronic Acid Injections: What is Their Place in Work Comp Claims? Millennials are slated to make up a bigger portion of the workforce in the near future, and the impact on healthcare, and by extension workers’ compensation, looks to be multifaceted, hitting topics such as diversity, alternative medicine, technology, and psychosocial concerns. The face of the U.S. workforce is changing, and while a portion of it grows older (see Valuable Assets: Appreciation and Care Considerations for Older Workers), there is a newer, younger population entering it en masse – the millennial generation. According to the U.S. Census Bureau, the 83.1 million millennials in the U.S. make up 25% of the population, and they now officially outnumber baby boomers.1 By 2020, they are expected to make up half the workforce,2 and they will undoubtedly shift claim demographics, making it important to understand how this generation may change workers’ compensation. This population is defined by much more than their age (which as of 2018, falls into the age range of 22-37, or those born between 1981-1996). This generation grew up with greater access to technology, and by extension greater access to information. They have also experienced incredible socioeconomic change in their lifetimes. So from a healthcare perspective, what sets millennials apart from previous generations? What does this mean for workers’ comp? Differences in ethnicity and socioeconomic backgrounds often present different health concerns, which play an important role in care management and – dependent upon how appropriately care is managed – patient outcomes. Considering that workers’ comp claims with a comorbid diagnosis can have twice the medical cost of other claims,6 understanding the health impacts of patient diversity is paramount to effectively managing care. Not only can ethnicity present nuanced medical considerations, but cultural differences can impact how a patient navigates workers’ comp and receives medical treatment. Beyond potential language barriers, members of different cultures may have different beliefs and attitudes surrounding issues such as reporting an injury, seeking care, disability, loss of work, and more, which can cause concerns in a claim if not properly addressed. Furthermore, members of different cultures may look beyond Western medicine and embrace folk medicine native to their culture, sometimes even visiting healers and other non-traditional health practitioners. While such approaches to care do not typically fall under the purview of workers’ compensation compensability, from a patient management perspective, it is helpful to have a holistic understanding of a patient’s treatment plan and to understand elements of cultural sensitivity. What does this mean? Quite simply, there is an increased demand for alternative therapies. Not only could this spur further research into their clinical effectiveness, but greater acceptance among medical communities and the general public could fuel questions of compensability surrounding alternative therapies. Regardless of compensability, patients may embrace alternative therapies on their own accord, making communication vital in establishing a more holistic picture of the patient’s recovery efforts to better manage care. 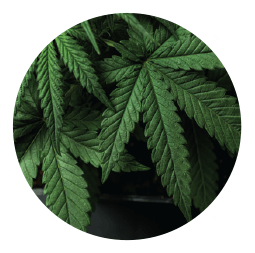 As marijuana continues to see varying levels of legalization for recreational and medical use across the country, the simple fact remains that as more people, particularly millennials, consume marijuana, its impact on claims will grow more prevalent, requiring action. This of course depends on state law regarding marijuana use and employment, qualifying conditions for medical marijuana, compensability for medical marijuana, and more. While millennials may be more open to alternative forms of care, they have not abandoned a connection with care providers. Quite the opposite: as a generation raised with the internet and greater access to technology, they often desire an increased and more informed connection with their care providers. 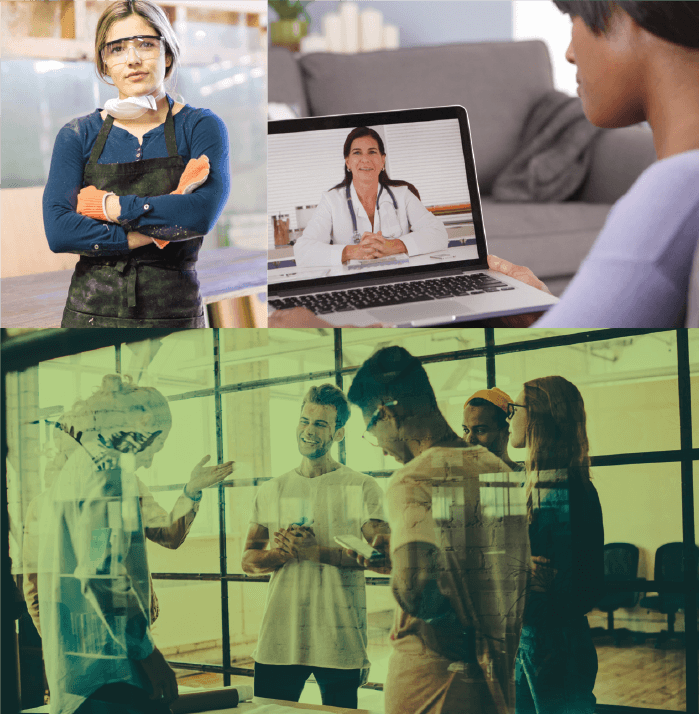 While the healthcare industry, and specifically workers’ compensation, is frequently slow to adopt new technology, the demand from millennial populations could pressure stakeholders into implementing newer technologies into their programs at a faster rate. Increased utilization of patient-engagement technologies could generate more meaningful patient data that, when used appropriately, could improve care management. However, implementing new technologies also comes with risks both anticipated and unforeseen, including cost, security, program compatibility, and more. Perhaps one of the biggest points of note is that millennials are significantly interested in telemedicine, with 60% of millennials supporting the use of telehealth options,18 and 28% of doctors predicting an increase in telemedicine due to millennials.7 This interest in telemedicine is likely to increase as more millennials enter the workforce. Forty-eight states currently provide reimbursement for some form of live video telehealth in Medicaid fee-for-service programs.21 There is clear precedent for telemedicine’s growth in workers’ comp, and that growth may increase substantially as millennials begin to make up high portions of claimant populations, making telemedicine a subject to watch carefully. Beyond healthcare and workers’ compensation, mental illness has received much more attention in mainstream media in the last several years than ever before, and for good reason. Many have attributed the increase in psychosocial concerns to an increase in stressors in the modern world. Such stressors would include changing family dynamics that reduce emotional support systems, such as increased divorce rates, a higher propensity to move further away from families, and the delay of marriage. MORE STRESS OR MORE DISCUSSION? One caveat on this increase in psychosocial symptoms is that, culturally speaking, millennials may simply be more open to discussing mental illness than previous generations, which could drive the higher numbers. This openness is a more recent social change that may better help uncover potential psychosocial barriers to recovery. Addressing these barriers as they appropriately relate to the workplace injury could facilitate recovery in ways previous generations were uncomfortable with. 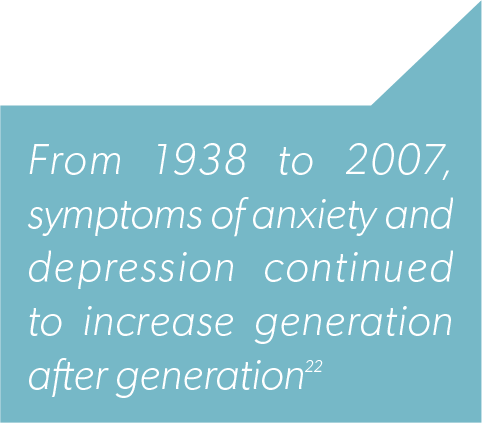 If this is the case, a stronger application of the biopsychosocial model, integrating treatment modalities such as cognitive behavioral therapy, could possibly result in better claims outcomes to a generation more willing to explore how their emotions impact their health. 1 -Millennials outnumber baby boomers and are far more diverse, census bureau reports. United State Census Bureau website. https://www.census.gov/newsroom/press-releases/2015/cb15-113.html | June 25, 2015. 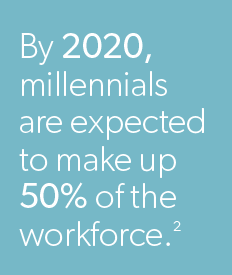 2 -Millennials at work: reshaping the workforce. PricewaterhouseCoopers. https://www.pwc.de/de/prozessoptimierung/assets/millennials-at-work-2011.pdf | 2011. 3 -Labor force projections to 2024: the labor force is growing, but slowly. Bureau of Labor Statistics website. https://www.bls.gov/opub/mlr/2015/article/labor-force-projections-to-2024.htm | December 2015. 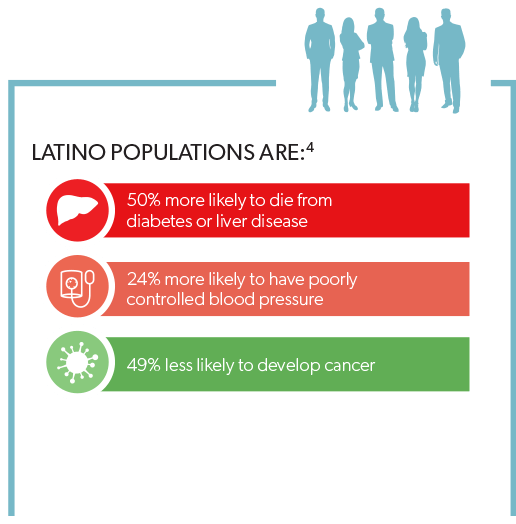 4 -Hispanic Health – CDC Vital Signs. Centers for Disease Control and Prevention website. https://www.cdc.gov/vitalsigns/hispanic-health | May 2015. 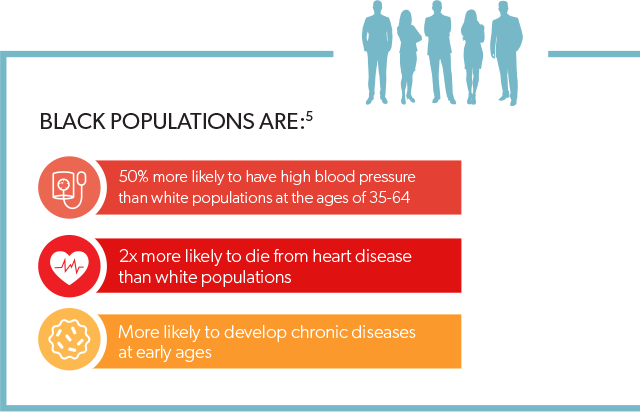 5 -African American Health – Creating equal opportunities for health. CDC Vital Signs. Centers for Disease Control and Prevention website. https://www.cdc.gov/vitalsigns/aahealth/index.html | May, 2017. Updated July, 2017. 6 -Laws C, Colon D. Comborbidities in Workers Compensation. NCCI. https://www.ncci.com/Articles/Documents/II_Research-Brief-Comorbidities-in-Workers-Compensation-2012.pdf | October 2012. 7 -Millennial patients challenging status quo, over 2,900 U.S. doctors say. Sermo Press Release. http://www.sermo.com/media/press-releases-view/89 | November 1, 2016. 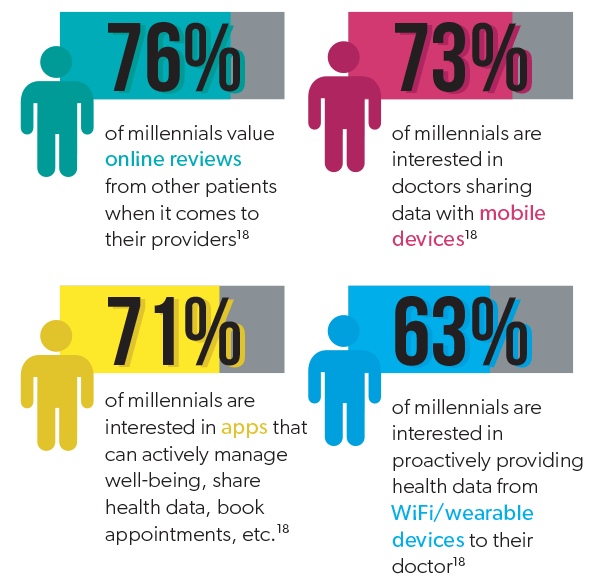 8 -Millennial mindset: healthcare marketing to millennials. GSW in collaboration with Palio and inVentiv Health PR Group | June 2016. 9 -Millennials are seeking the fountain of youth through healthy aging. Nielsen website. http://www.nielsen.com/us/en/insights/news/2014/millennials-are-seeking-the-fountain-of-youth-through-healthy-aging.html | May 13, 2014. 10 -Health and healing in America: majorities see alternative therapies as safe and effective. The Harris Poll. https://theharrispoll.com/for-many-the-term-healthcare-likely-leads-to-visions-of-doctors-and-prescriptions-but-for-some-it-can-mean-so-much-more-alternative-treatments-also-known-as-non-conventi | May 10, 2016. 11 -The evolution of alternative medicine. The Atlantic. https://www.theatlantic.com/health/archive/2015/06/the-evolution-of-alternative-medicine/396458 | June 25, 2015. 12 -Noninvasive treatments for acute, subacute, and chronic low back pain: a clinical practice guideline from the American college of physicians. Annals of Internal Medicine. http://annals.org/aim/fullarticle/2603228/noninvasive-treatments-acute-subacute-chronic-low-back-pain-clinical-practice | April 4, 2017. 13 -FDA education blueprint for healthcare providers involved in the management or support of patients with pain. Food and Drug Administration website. https://www.fda.gov/downloads/Drugs/NewsEvents/UCM557071.pdf | May 2017. 15 -Support for marijuana legalization continues to rise. Pew Research Group. http://www.pewresearch.org/fact-tank/2016/10/12/support-for-marijuana-legalization-continues-to-rise | Oct 12, 2016. 16 -One in eight U.S. adults say they smoke marijuana. Gallup Poll. http://news.gallup.com/poll/194195/adults-say-smoke-marijuana.aspx | Aug 8, 2016. 17 -Monitoring the future: national survey results on drug use: 1975-2015. University of Michigan, sponsored by the National Institute on Drug Abuse and the National Institute of Health. http://monitoringthefuture.org/pubs/monographs/mtf-vol2_2015.pdf | 2015. 18 -2015 State of the connected patient. Salesforce & HIT Consultant. https://a.sfdcstatic.com/content/dam/www/ocms-backup/assets/pdf/industries/2015-State-of-the-Connected-Patient.pdf | February 2015. 19 -Telehealth & remote patient monitoring. IHS Technology. https://cdn.ihs.com/www/pdf/Global-status-overview-of-virtual-healthcare.pdf | November 2016. 20 -Global telemedicine market analysis & trends – industry forecast to 2025. Research and Markets. https://www.researchandmarkets.com/research/92w723/global | Dec 2016. 21 -State telehealth laws and reimbursement policies: a comprehensive scan of the 50 states and the District of Columbia. Center for Connected Health Policy – The National Telehealth Policy Resource Center. http://www.cchpca.org/sites/default/files/resources/Telehealth%20Laws%20and%20Policies%20Report%20FINAL%20Fall%202017%20PASSWORD.pdf | 2017. 22 -Twenge JM, Gentile B, DeWall CN, Ma D, Lacefield K, Schurtz DR. Birth cohort increases in psychopathology among young Americans, 1938-2007: a cross-temporal meta-analysis of the MMPI. Clinical Psychology Review. 2010. 23 -Stress in America: coping with change. American Psychological Association. https://www.apa.org/news/press/releases/stress/2016/coping-with-change.pdf | Feb 15, 2017. 24 -Youth employment and unemployment in July 2010. Bureau of Labor Statistics. https://www.bls.gov/opub/ted/2010/ted_20100903.htm?view_full | Sep 3, 2010. 25 -New York City’s millennials in recession and recovery. New York City Comptroller. https://comptroller.nyc.gov/reports/new-york-citys-millennials-in-recession-and-recovery | April 26, 2016. 26 -Millennials after the great recession. Bureau of Labor Statistics. https://www.bls.gov/opub/mlr/2014/beyond-bls/millennials-after-the-great-recession.htm | Sep 2014.